Long ago I promised a set of the “three wise H’s”. 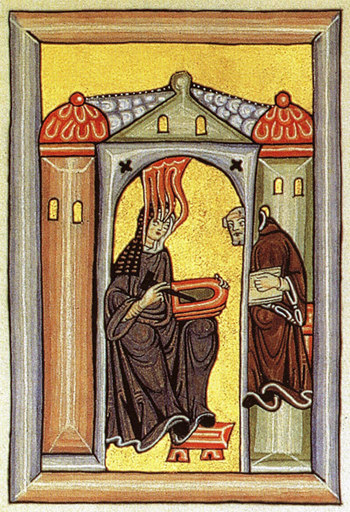 After Hrotsvit and Heloise, we are overdue to hear about Hildegard, and Good Friday seems like the perfect time to promote one of the great medieval Christian philosophers. She lived for most of the twelfth century, born in 1098 and dying in 1179 at the age of 81 (pretty impressive for that time). We have such accurate dates for her because, as the Abbess of a prominent Benedictine convent and published theological writer, she was one of the minority of people of this period whose lives were documented extensively. This hoyden is one of the great thinkers of Western history. A Renaissance woman well before the Renaissance, she wrote long tracts on theology, but also wrote music and poetry. Hidegard had numerous tussles throughout her life with Abbots and other male religious leaders who wanted to curb the high level of self-governance of her convent. She always won. She never ceased her work in pioneering areas of thinking and writing, and the results are still known and valued. I can’t hope to compete with the detailed biography provided by Sabina Flanagan from the University of Adelaide, everything you could want to know is there. From Fordham University, this biog is also good. Is she being touched by his noodly appendage or attacked by Cthulhu in that illustration? A contemporary and correspondent of Eleanor of Aquitaine, too. A fascinating period for self-determining aristocratic women, one wonders how and if that influenced women of the lower social orders, whose lives of course were hardly ever documented. This is the weirdest coincidence – I was only today hearing about Hildegard von Bingen for the first time, in a Twelfth Planet Press/Fablecroft book launch at Swancon. Juliet Marillier spoke about her contribution to Cranky Ladies of History (a collection of stories from Fablecroft, released on International Women’s Day this year). Marillier’s story in the anthology is about Hildegard. probably just have a running Pozible tab for Fablecroft/Twelfth Planet Press.